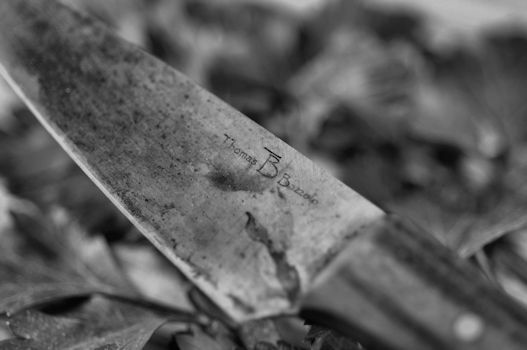 Your knife is crafted from A2 steel, a non-stainless, high carbon tool steel. If not properly cared for, all carbon steel knives will stain. Your knife will benefit from a little more attention than stainless steel knives but will require only minimum care. When you use it to cut acidic foods, like citrus fruits for example, the steel will react by turning slightly grey. This is a form of oxidation and over time, will create a soft grey patina that will give the knife its character. But food left on the blade may turn the steel black or form rust. Immediately after cutting highly acidic foods, always rinse your knife. Never wash your knife in a dishwasher! The extreme heat will damage or loosen the wood handle on your fine cutlery. Handwash it in warm soapy water when finished using the knife. Avoid soaking the knife in water. Prolonged immersion in water may cause the wood handle to swell or split. Always wipe the knife dry. If you put your knife away wet, it will rust. If you find rust on the blade that cannot be removed by handwashing, carefully rub the blade with a fine Scotchbrite pad wet with olive oil. It will remove fine surface rust and if not used too aggressively will leave the nice patina. The handle has been stabilized with a wood saturating epoxy and requires no maintenance. Although not necessary, occasional wiping with food safe oil will do no harm. Periodic sharpening with a knife steel/hone is all that is required to maintain a keen edge. A couple swipes should do. The frequency of touch up will depend on the amount of use the blade receives. When the knife steel/hone is no longer effective, professional sharpening is recommended. I will gladly sharpen your knife without charge. Simply send it to me and include the return shipping. Similarly, I may be able to regrind minor accidental damage. Contact me first. One final note is in order. Your knife is a cutting tool for fresh food preparation. If you use it as a cleaver on frozen food, a prying tool, can opener, screwdriver or for any use other than for what it was designed, you or another person may be seriously injured. Of lesser concern, would be damage to the knife.